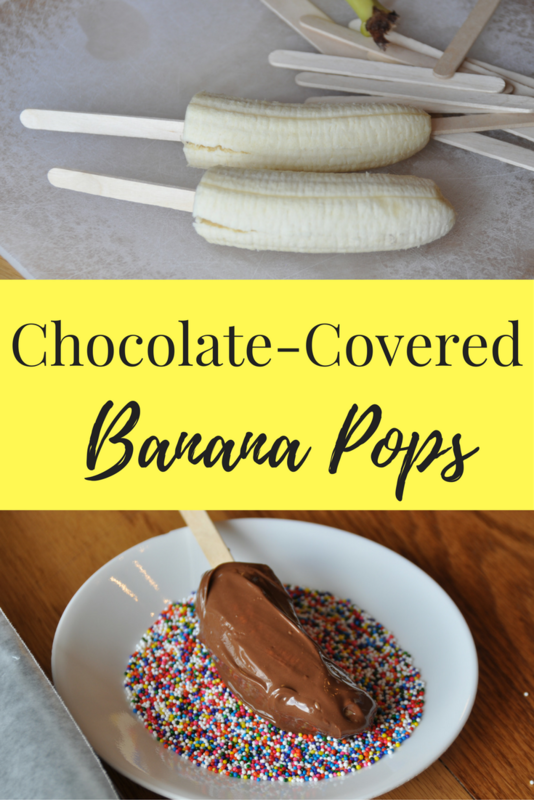 I loved making these Chocolate Dipped Banana Pops for my kids while they were growing up and then teaching them how to make them as they learned to cook. 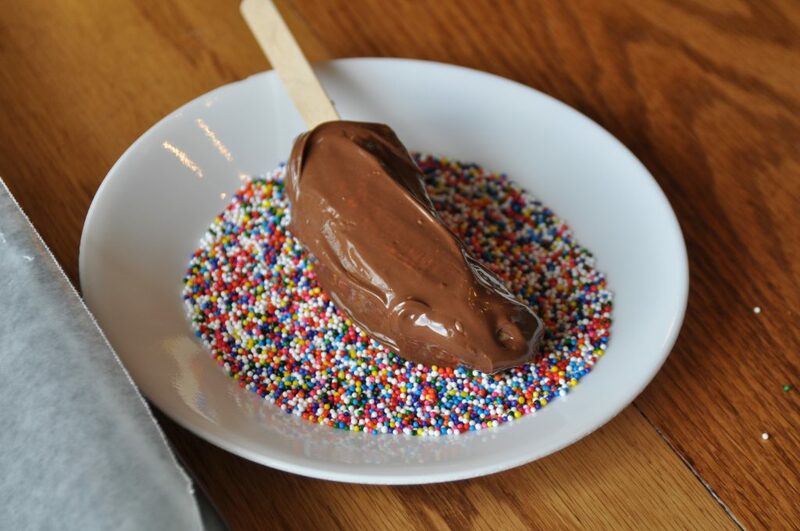 Chocolate Dipped Banana Pops are perfect for a hot day, or any time family and friends get together. Besides being very economical , they are so simply and quick, it’s a great treat or snack to whip up; and who doesn’t love chocolate! 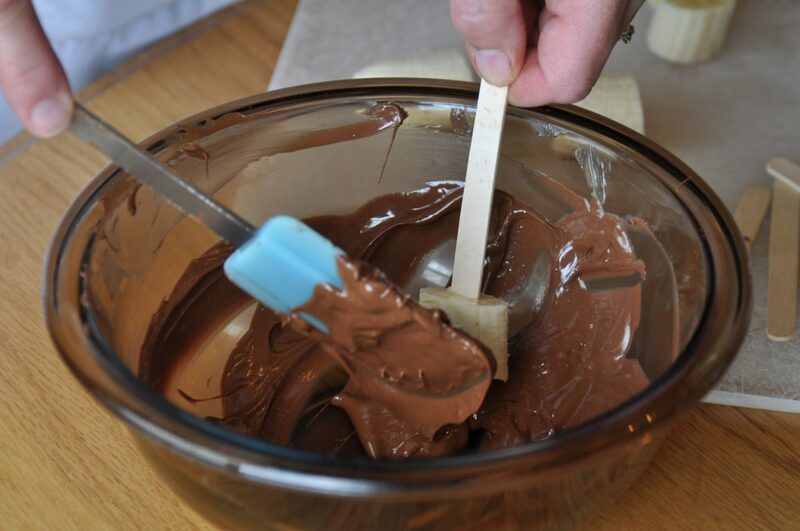 Dipping the Chocolate Dipped Banana Pops in sprinkles, nuts, whatever you’d like makes them special to your taste. Freeze extra to have on hand for a frozen tasty dessert. Cut the bananas in half , or in chunks about 3 inches in length, which is actually easier for dipping and eating. 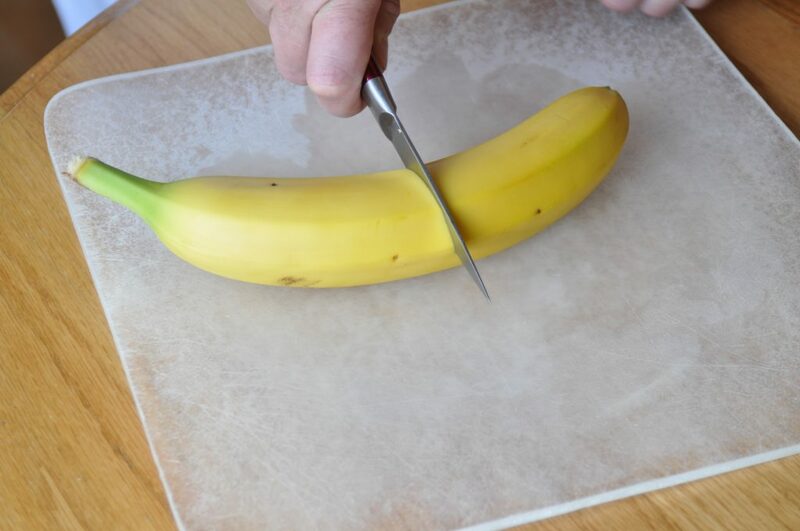 Make a small slit in 3 places at the cut end of the banana to make it easier to peel. Place stick in end of the banana, pushing in about half way through to make it secure. 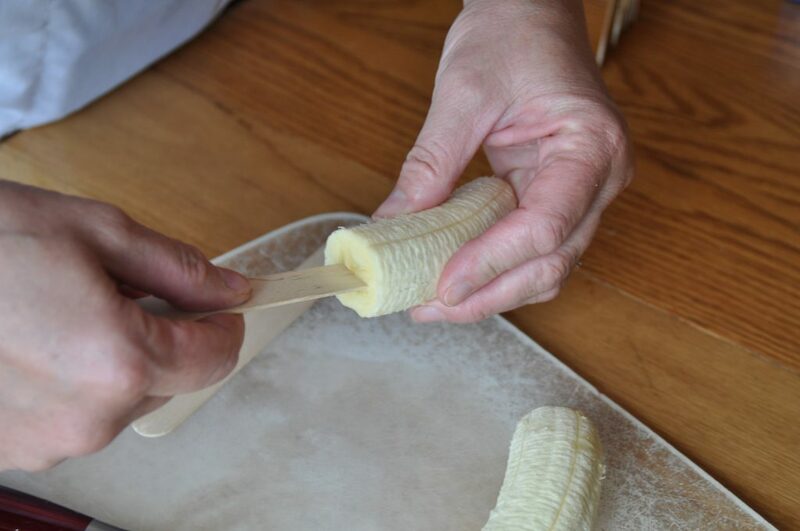 If cutting into chunks, push craft stick almost through the banana piece. 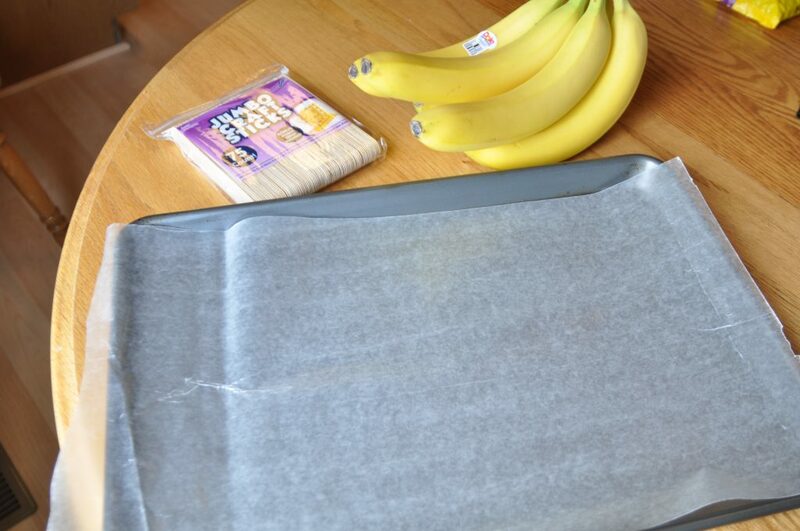 Place bananas in freezer to help them be a bit more firm when dipping. While the bananas are in the freezer, pour the chocolate chips into a microwavable bowl, along with the shortening.Heat the chocolate chips and shortening for 30 seconds, stir and repeat a few times until the chocolate is melted and smooth. **Do not over heat as this will make the chocolate clumpy and not usable for this recipe.When the chocolate is melted, take the bananas out of the freezer, and one at a time, roll in the bowl of melted chocolate using a spatula to help coat the banana with chocolate, scrapping of a bit of chocolate if it is too thick. Roll in desired toppings, or leave plain. 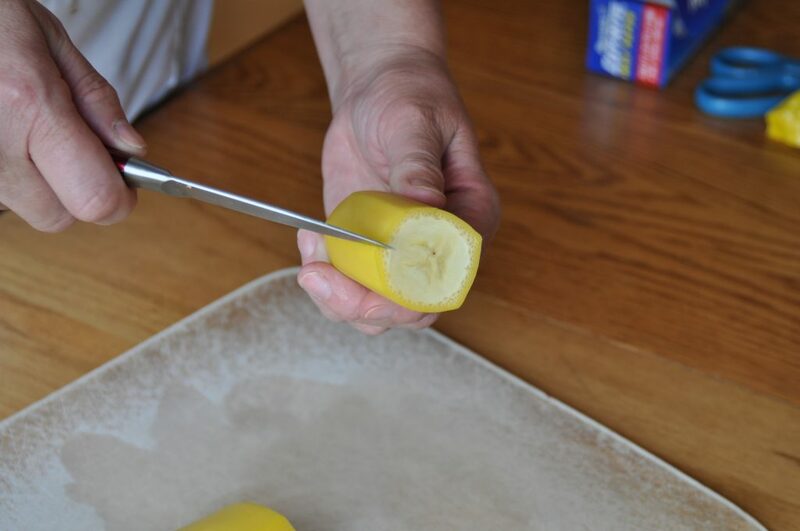 Place the bananas back in the freezer to firm up as each one is coated. Enjoy now while the center is still soft, or place in a zip-lock freezer bag to eat later. Some like the frozen bananas straight from the freezer and some like to let them sit at room temperature for 10-15 minutes to soften a bit making the center of the banana creamy and like ice cream. Either way, ENJOY!! !